Thank you for taking the time to explore our website. We know pastors have busy schedules that are demanding of personal time, family time, and energy. Several of our team members have worked in various ministries or have family members who have had ministry jobs. Therefore, we can relate to the unique tensions and responsibilities that are placed on pastors and their families. Knowing this, we want to offer ways we can serve you, your family, and your church. At Restoration Counseling we are a group of professional Christian counselors who uphold clear values in faith and in our counseling practice. We strive to explore truths in psychology that reflect the Truth found throughout the Bible and in Christ Jesus. Below you will find more information about us and some Q&As. If, you would like to schedule a face-to-face meeting, please feel free to contact Carianne so we can set up a time and discuss how we can best serve you. One way we serve you is by providing a safe, non-judgemental environment that is centered on the gospel of Christ. Often times pastors and their families are not given the freedom to express pain, confusion, and sorrow. There might even be pressure or perceived pressure to do and be certain ways. Therefore, we aim to empathize with your situation and in due time, compassionately help you rediscover and appreciate truths that may seem hard to believe. Another way we can help you is by serving your church. First, below you will find a list of curriculum/resources we believe are useful within any church body. If, you have something more specific in mind, then we would love to set up a meeting with you and another staff member to discuss your specific needs and any options we might be able to provide. Finally, there are times throughout the year when we offer different seminars, workshops, or small group meetings. If, you would like to be added to our mailing list, please feel free to contact us. We would love your permission to contact you about different opportunities you can then offer your congregation. Do you have church members you would like to refer to us and sponsor? After filling out a couple of forms, we can bill you directly on a monthly basis. Is Restoration affiliated with a particular denomination? The staff at Restoration Counseling work with people from various denominations; therefore, we are not affiliated with a specific denomination or association. How does Biblically based counseling differ from secular counseling? How can my church partner with Restoration? We would love to sit down with you and determine a plan that best suits the needs of your church. We offer professional development and counseling services for church staff and a “go to” person when you are in need of more resources. We also partner with churches to work out sponsorship agreements with church members who might need financial help in order to attend counseling. This resource is a 29-week intensive Bible Study designed for men and women who want to understand and apply God’s principles for healing. This study gives the participant the opportunity to process painful events that have happened in their lives. At EHS, we are dedicated to pointing people to an authentic, vibrant and deeply transformational relationship with Jesus. We know that spiritual maturity and emotional health are inseparable and have developed a strategy for discipleship that integrates both of these key components with a slowed down lifestyle that puts being with Jesus before doing for Jesus. GriefShare groups meet weekly to help you face challenges after a loss and move toward rebuilding your life. Each GriefShare session has three distinct elements: video seminar with experts, support group discussion with focus, and personal study and reflection. We believe most Christian parents desire to lead their children spiritually. Unfortunately, this task seems daunting and directionless. Legacy Milestone is an effective way to help parents explore ways to lead their kids, at any age, down the path of faith. 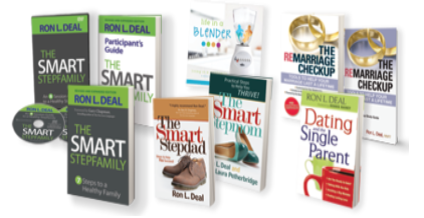 Ron Deal has done an incredible job helping believers understand the murky waters of blended families. With the number of blended families growing in the United States, the church needs to be able to effectively guide and encourage men and women who desire to seek the Lord in a circumstance that has little Biblical guidance. Deal acknowledges the challenges that are different for blended families, both spiritually and practically. He also gives practical and spiritual guidance that is unprecidented and Biblically sound. He has several books and other resources that could be useful to any blended family in your church body.